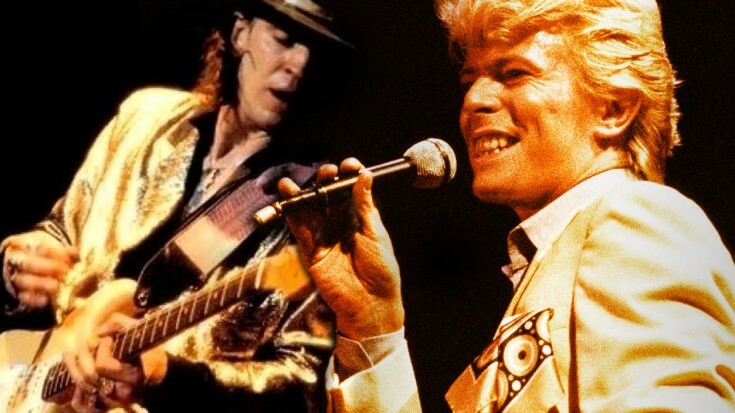 Despite David Bowie’s generous offer to take him on tour, in 1983 Texas blues legend Stevie Ray Vaughan declined the offer just before the start of Bowie’s Serious Moonlight Tour in pursuit of his own interests. Stevie did, however, participate in tour rehearsals with David Bowie and his band, and lucky for us, someone caught the entire rehearsal session on tape! Recorded live at the Las Calinas Soundstage in Dallas, Texas, this audio features Stevie Ray Vaughan running through “Let’s Dance” – I don’t know if it’s a case of David Bowie only working with the music industry’s best and brightest or if this is just a really, really good rehearsal session, but this rendition of “Let’s Dance” sounds just as amazing as an actual studio recording! Some highlights of the “Let’s Dance” rehearsal include the explosive solo that Stevie plays beginning at 3:41 and running until the end of the song nearly two minutes later, and at the end you can hear Stevie, David, and the rest of the band complimenting each other on a job well done. Fun Fact: The final night of Bowie’s Serious Moonlight Tour fell on the third anniversary of the death of John Lennon. In honor of John’s passing, Bowie and his band performed “Imagine” that night. Even if we never did get to see these two legends take the stage together, the audio of a normal rehearsal session is pretty telling: it would have been absolutely amazing! With David’s flair for the dramatic and Stevie’s intensity, “Let’s Dance” would have been quite a barn burner on the Serious Moonlight Tour!